Currently, we are upholding 2 branches situated in Kota Kemuning Shah Alam and Bangsar South Kuala Lumpur. There are a total of 8 dentists working in both branches each with various ranges of expertise and interests. WDCC is specialized in laser dental treatment and total patient care. 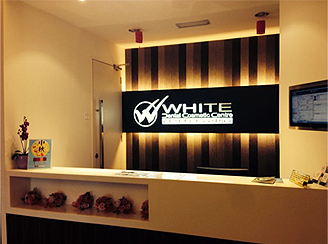 Our missions are simply "W.H.I.T.E" which resemble White bright smile, Hospitality assurance, Innovative solutions, Total care and Excellent service. WDCC is still considered as a subsidiary of ST Tiew Dental Group but bears improved treatment and service quality. WDCC also holds various collaborations with other health care facilities and agencies to stretch our services to everyone at any part of the world. With a more digitalized system, you could actually reach us swiftly. Appointments could be booked online and enquiry could be made instantly online as well. Once the booking is confirmed, you would be advised on your requirements for the appointment. It is time to give yourself a chance to know your dental health in depth and how to maintain it well. It is our greatest pleasure to serve and know you. We look forward to the opportunity to serve you and hope we could meet your needs and deliver a confident smile with good health to you.